Two things happened before the calendar year turned from 1996 to '97. First came the arrival of a chubby kid on the #768 Kawasaki named Ricky Carmichael. 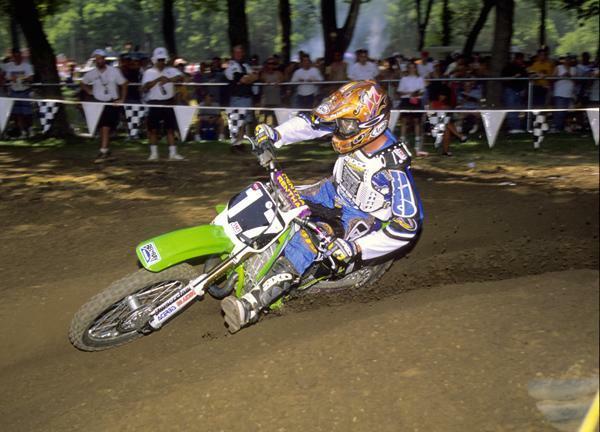 After basically dominating amateur motocross in America for much of his young life, Carmichael turned pro at the series-ending '96 Steel City National. He rode well, though he did not finish in the top five. 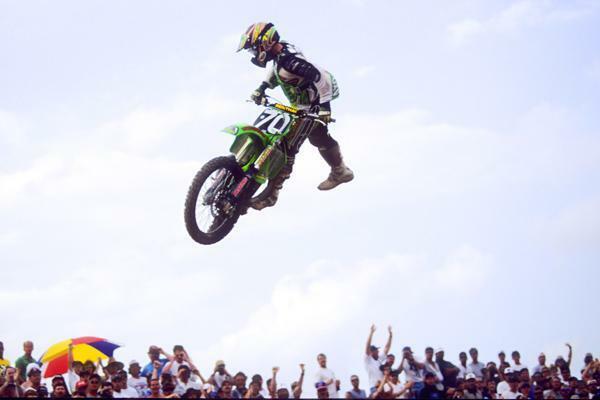 He even got dropped at one point by another star-in-the-making, albeit in a different form of motorcycling: Brian Deegan. 1997 saw the arrival of the GOAT. Most saw Carmichael on the horizon, but few saw the big thing that happened that off-season. Jeremy McGrath shocked the entire sport by quitting Team Honda to ride a Suzuki! After six great years with Honda, winning six straight titles—two 125 West ('91-'92), four in AMA Supercross ('93-'96), plus the '95 AMA Motocross crown—the superstar was having a hard time coming to terms with Honda's tight imagine guidelines. With his glowing personality and charisma, the popular McGrath was on the leading edge of celebrity, personal sponsorship, the growing video market and more—he's nicknamed “Showtime” after all!—and Honda was much more corporate and old-school about such things. So McGrath took his #1 plate and went yellow. Honda was left with Steve Lamson, a superb 125cc rider but one who had never won a 250cc race, and Scott Sheak, something of a project when Big Red signed the privateer from New York. In AMA Supercross, McGrath's move had a slightly better effect for Suzuki than Honda. McGrath won two races and gave Jeff Emig a good run for the title, but a flat tire in the late going kept him just a little too far back. Kawasaki's Emig took his one and only AMA Supercross title even while filming segments of the cult-classic motocross movie Fresno Smooth… If you've seen the movie, you know how unlikely that may have appeared! In a surprising move McGrath went yellow in '97. The AMA Supercross tour ended with an earth-shaking moment. After being the early points leader on his YZ250, Yamaha's Doug Henry tangled with Chaparral Yamaha's Jimmy Button at one of the middle rounds and broke his hand. That knocked him out of the points chase, so Yamaha asked Henry if he might be interested in trying out their prototype 400cc four-stroke motorcycle at the season-ending Las Vegas SX. Henry said sure, and the white bike turned out to be the perfect machine for the slick, hard-pack Vegas track. Henry won the main event, and in doing so became the first rider in AMA Supercross history to win a race on a four-stroke. Little did we as a sport know that the revolution was upon us, and the sport would change drastically over the years that followed. McGrath was less successful outdoors. The loss of not only his AMA Motocross title the previous year to Emig, but also his AMA Supercross title now, seemed to distract him. He rode well that summer for the most part, but he was not the Jeremy of old outdoors. He would finish third behind Emig, the future Hall of Famer who was having his best season ever, and the veteran John Dowd. That is Mike Brown on the #21, who amazingly is still strapping up the race boots today. As for Henry, he returned to Budds Creek, the track that had nearly robbed him of his career, and ended up breaking both of his wrists on the old “Big Gulp” uphill doubles. It was a terrible sight, seeing Doug in pain alongside the track, where he had to have fans help him get his helmet off as he awaited medical attention. But one again, Henry would return, somehow faster than ever. Also, Damon Bradshaw's one and only win on a Honda—his 30th and final as an AMA Motocross/AMA Supercross rider—came at the super-muddy High Point National. After losing his edge since his sudden hiatus in 1993, Bradshaw found his old magic on a Manchester Honda CR250 and beat a game Larry Ward for the very wet overall win. Here is Emig on set of the "Fresno Smooth" video shoot, a fake commercial for "Emig-Os" with Jeremy Albrecht, then his mechanic. That same day, Scott Sheak put it all together to win his first and only national in the 125 class. 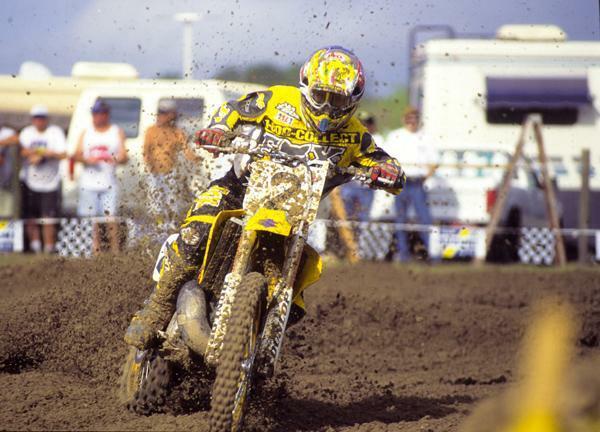 That afternoon also marked the worst national in Ricky Carmichael's otherwise amazing career (at least until the '06 Glen Helen National, where he hurt his shoulder and pulled out). The Splitfire/Pro Circuit Kawasaki rider had swept each of the first three rounds, basically announcing his arrival on the professional scene with multiple exclamation points. But at High Point, RC got into his first mud race and the barely finished in the points. It was such a bad day that the knock on RC would be that he couldn't ride in the mud for the better part of the decade to follow…. at least until he lapped everyone at Millville '06! The things that the rookie did in 1997 would become the trademarks of his career. He would crash hard and often in Supercross until he finally figured it out. He would show great versatility outdoors and dominate from the start. He stayed healthy all summer long and never let off the throttle. He would clinch before the final round—something he would do on the way to all 10 of his AMA Motocross Championships. Damon Huffman would finish seventh in the 125cc class in '97. It was a changing of the guard too as Mitch Payton's Pro Circuit outfit asserted itself as the top team in this class, with Honda of Troy (soon to be Yamaha of Troy) in pursuit. And McGrath ended the '97 season by announcing that he would be starting up with a satellite program—Chaparral Yamaha—and coming back for his title in 1998. And after sheer dominance in 1996, Team USA would go down in defeat at the Motocross des Nations in Belgium, as Emig, Dowd and Steve Lamson struggled on an over-saturated Nismes track.